HubSpot has officially released the latest update to the HubSpot mobile app. This is one of the company’s bigger updates since the 3.0 update we saw in January that added the highly anticipated Conversations feature to the app. The update focuses on two main features, an updated fresh look, and a new navigation architect and while it better highlights some features like conversations and deals, there is still a lot left to be desired. One of the biggest changes in the update is the overall navigation of the app. Because of this change, you can now find tasks in the bottom navigation, and a “more” tab in the bottom right. The “more” section on the bottom nav acts as an overflow menu for the features not visible on the navigation. There, you will now be able to see features like conversations, your digest, and your settings. The update also brings many UI changes. Does This Improve the App? While we love seeing the HubSpot app continue to grow, there are still many features the app lacks and some changes that are rather questionable. It is difficult for a user to understand who the app is made for and who should be using it as it has Sales, Marketing, and Service features mixed together. The digest is a good representation of how unfocused and confusing the app can be, pulling information from blog performance to deal updates. On top of that, it acts as the half-baked analytics portion of the app and lacks a true performance section that it so desperately needs. 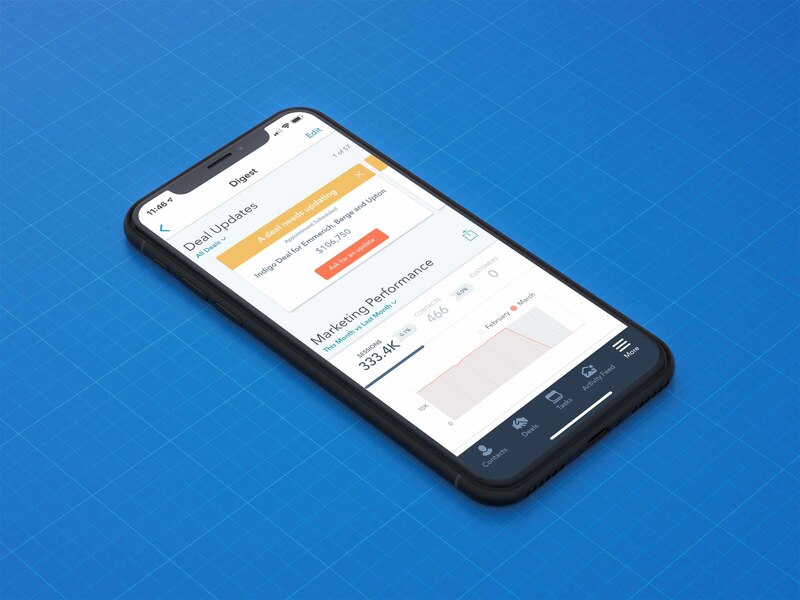 One of the main reasons someone (especially executives) would use this app is to quickly check the performance of their HubSpot account and the ability is still extremely limited. There are also still those obvious (or what seems obvious) features that the app lacks. Overall, it feels like the app needs to be a better reflection of what users will realistically want and be able to do effectively on-the-go. As we continue to make our wishlist of what we want to see in the HubSpot app, we hope to see many more updates to the mobile app in 2019. While there is still much to be desired, make sure to download the update on the Apple App Store or Google Play Store in order to take advantage of the new features that were added, especially Conversations. Also, be on the lookout (I know we will) for more updates to come this year and see how the app evolves.